I’ve started a writing group. We met for the first time last night for an organizational meeting. Yeah, yeah, I know. Back when I stepped down from the PTA (a full month and a half ago! ), I vowed that I’d take a break from organizing things. So much for that. But this is different. First of all, it’s only five people. And second of all – unlike the PTA, which was loads of fun but fundamentally about raising money for a cause – this one’s about me. I’m doing it for precisely the same reason that I encouraged all of you to join a club this Autumn: pursuing hobbies in adulthood is fun. Of course, I’m not only doing it because it’s fun. I’m also doing it because I think that it’s going to be worthwhile professionally. Why is that? And that means that while it’s a friendly crowd, we’re not there to chit-chat about our lives. We’re there to get feedback on our work. So unlike, say, a book club, which is – at the end of the day – a fundamentally social experience, this club feels more serious. And that suits me just fine right now. I’m also joining this group because I think that as a writer, working across genres really helps you to stay fresh. You exercise different parts of your brain. You get out of your comfort zone. You keep yourself from getting bored. I was thinking about this yesterday when I happened to be working on two different projects that took me away from my ordinary blogging duties. One was a travel piece and the other was an interview that I did for a commercial outlet. At the end of the day, I felt really refreshed. And I think that’s because I stepped away from my routine. So I’m hoping that by adding some fiction writing back into the mix, I’ll continue to keep myself crisp as a writer. But mostly I’m doing this because I need to confront the beast. (That would be my novel…you know, the proverbial one that sits in a drawer somewhere, only to be very occasionally dusted off and sent out to greet the world?) It’s time for a fourth down, kick-0r-stick moment with that sucker. (Forgive the cheesy football analogies. I think we all know that sports isn’t my thing.) Either I’m going to go back to the drawing board, and use this writing group as way to workshop the hell out of that thing…or I’m going to have a fancy new footrest as I embark on some new ideas. Either way, it’s time to make a move. How do you keep yourself fresh at work? For those who are interested, here’s a piece I wrote for Politics Daily on how some people in Germany seem to be forgetting the Holocaust. 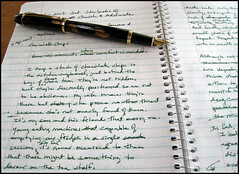 Image: Writing Challenge by Starbuck Guy via Flickr under a Creative Commons license.